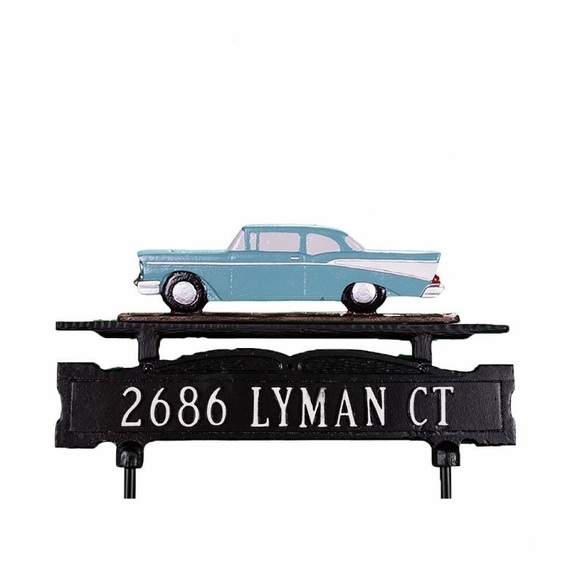 Lawn Address Sign + Classic Car Ornament - - personalized two-sided address plaque. Lawn mount. One line or two lines of personalization. Made in USA. Ornament finishes: gold bronze, swedish iron, teal and white, red and white, and black and white. Custom made for you. Please allow 3 to 6 weeks for delivery. Do you remember when gas was cheap and cars had big tail fins just like the ones on the Classic Car Ornament? Classic car lovers -- this sign is for you!